Saturday, June 21. 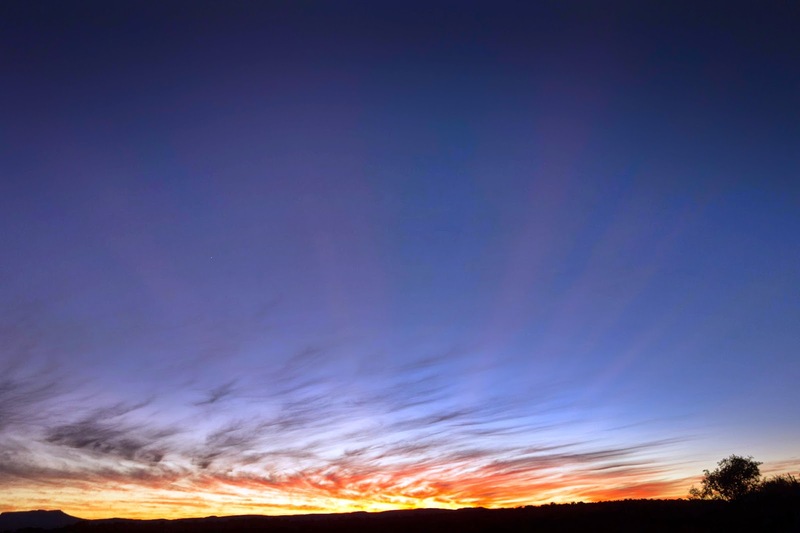 Winter solstice — the darkest day of the year. 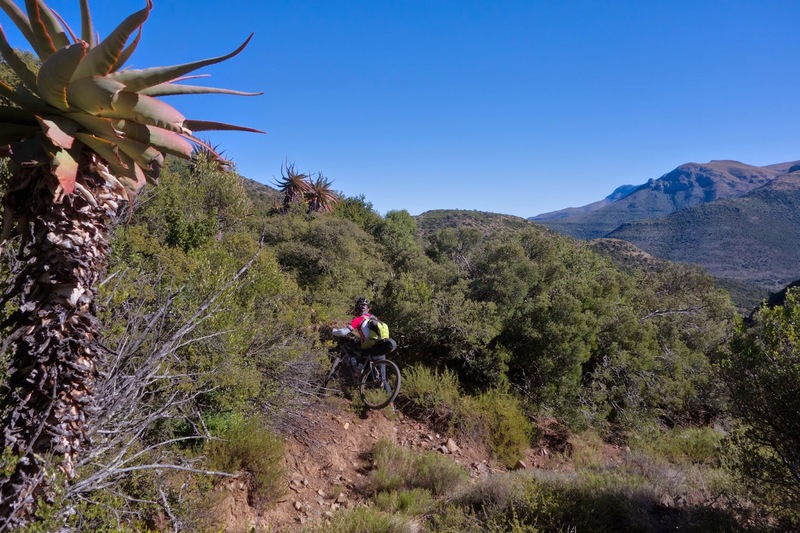 Grootdam was one of my more restful stops on the Freedom Trail — multi-course meal, a high-pressure hot shower, and rare success in sleeping through most of the night without any nightmares about losing the track. We even slept in — the proprietor told us the farm gate didn't open until 6 a.m., so we opted for a 6 a.m. start rather than climbing a gate first thing in the morning. Still, when I woke up in the morning, my right ankle was stiff and mildly swollen, with purple bruising appearing near the edges. Definitely sprained, but at least it was just sprained. Morning brought a steep climb out of a sandy valley, followed by a cross-country traverse along a desert ridge. This traverse, which seemed to start and end nowhere, was inexplicably marked by white painted stones — which, given the more likely possibilities here, make for a much-appreciated trail. The white rocks guided us to a rim before plummeting into a gorge down a steep, boulder-clogged gully. 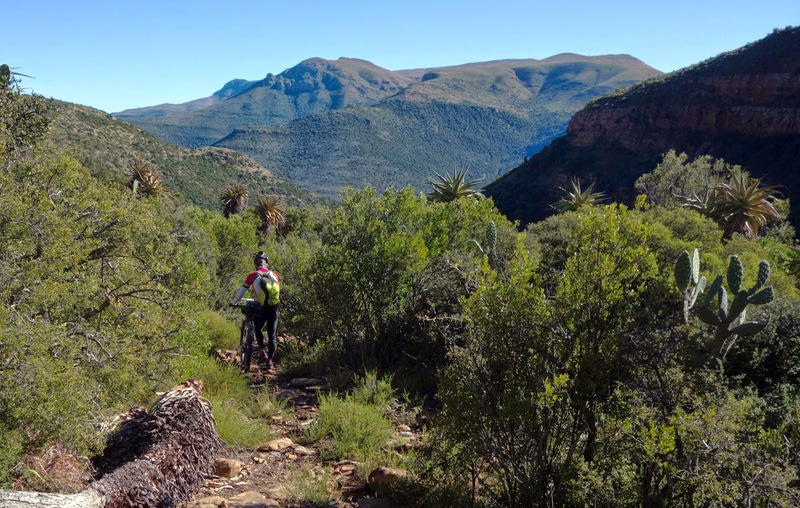 Just as quickly, the sandy desolation of the Karoo transitioned to this strange, almost lush climate with thick brush, palms, and cactus, along with a harmonious chorus of bird calls and barking baboons. Liehann and I both independently likened the ambience to that Jules Verne story, "Journey to the Center of the Earth," about a group who descend lava tubes into a prehistoric world populated by dinosaurs. It almost felt as if a velociraptor might leap out of the bush, and Liehann was thrilled with the adventurous atmosphere of the place. But we were both struggling physically — me with my sore ankle, and Liehann with his swollen shin. The best way to get down the boulders was to hook the bike's saddle on my shoulder, but this seemed to place more painful pressure on the sprained ankle no matter which shoulder I hooked the bike on. Progress was extremely slow — well under a kilometer an hour — and about midway down the canyon I hit another bonky wall. I was just extremely hot (probably more of a result of poor thermoregulation than an actual high temperature) and out of sorts. We sat down for a break and I ate a bag of crackers and three salt tablets, which seemed to help. Even still, despite the good night of sleep and continued snacking, my energy levels did not improve. We needed to take a detour into the town of Pearston so Liehann could pick up a bleed kit that his parents had mailed to him — in another frustrating mechanical, his rear brake stopped working. As we rode through town, I started pointing out convenience stores so we could stop for a cold drink and ice cream. That's when I learned Liehann was actually in a big hurry — our next support station, Gegun, was only supposed to be a lunch stop. I was having a rough morning and up until that point thought Gegun was our day's destination. I mounted a protest. Our hike down Struishoek portage was much slower than it should have been, and after the detour into town, it was already 1:30 in the afternoon. At best it would be 3:30 by the time we covered the 30 kilometers into Gegun, and after that we only had about two hours of good daylight left. 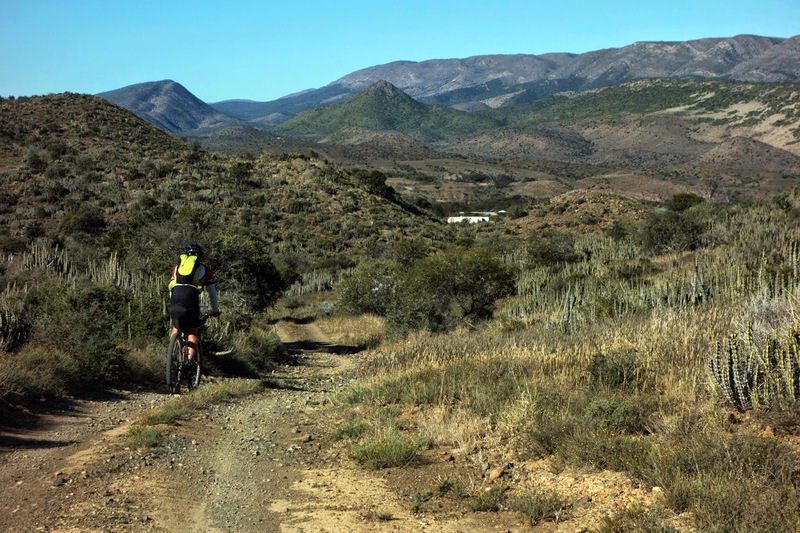 The next 52-kilometer leg included four kilometers of portaging and 30 kilometers of intermediate technical riding, through an area where navigation looked like it might get tricky. "We're going to ride most of that after dark," I argued. "If we're going to do that we might as well just start planning now for spending the night out. We should at least pick up some extra supplies here in town." Liehann thought I was being too alarmist on the matter, but he also seemed concerned about even a remote possibility of spending the night outdoors. Although I didn't feel fully prepared for a night out, camping was not my main concern. I had a good bivy sack and warm layers, as well as firestarters, and I've spent a few cold nights sleeping outside with less than adequate gear, so I felt I had the past experience to mentally deal with a night out in the frigid South African bush. My main concern was feeling horribly lost for an entire night, a mental blow that I wasn't sure I could handle. I no longer cared about our twenty-day race plan — only about managing my fear-of-being-lost issues. "I don't mind doing the work," I said. "I'll ride all day and all night when we get to the longer road sections. 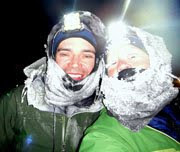 I could go through the rest of this race perfectly happy if we don't have to do any more night navigation." Liehann pointed out that we'd have to make a new plan if we stopped early. Although the Freedom Challenge is a nonstop race, most participants treat it as something of a stage race with stops at specific full support stations. Intermediate stops didn't usually accommodate overnight stays. Changing the schedule might mean reshuffling plans for more people than just us, but my concerns about sleeping out eventually swayed the argument in my favor. Liehann called the race director and worked out a schedule that would put us at intermediate stops for the next three days before a really tough portage into the Baavianskloof. The day after winter solstice, I woke up feeling markedly better. The long stop at Gegun had done me some good — we installed a new chain on my bike, bled Liehann's brakes, ate two dinners and breakfast, and recovered both of our injuries enough that most of the swelling had gone down. The four-kilometer portage was actually quite easy, following a steep track. At one point Liehann was a few minutes behind, and I stopped at an intersection to scrutinize the map. There were bike tracks going off in both directions, and the cues seemed to direct us to the right. But after mulling it for several minutes, I was convinced we needed to go straight. When Liehann arrived, he was convinced we should go right. He and I occasionally had debates about directions, and I usually conceded. But this time I was certain my way was correct. "I knew you were going to argue with me," I pouted, then pointed to my map. "See, here, this side trail goes straight up these contour lines, while the correct trail wraps around the hill. Here is where I think Bugs and Allen came back down; see their tracks curve like they turned right on this road, not left from behind." Liehann was still skeptical, so I requested we just ride down the hill and look for another intersection. 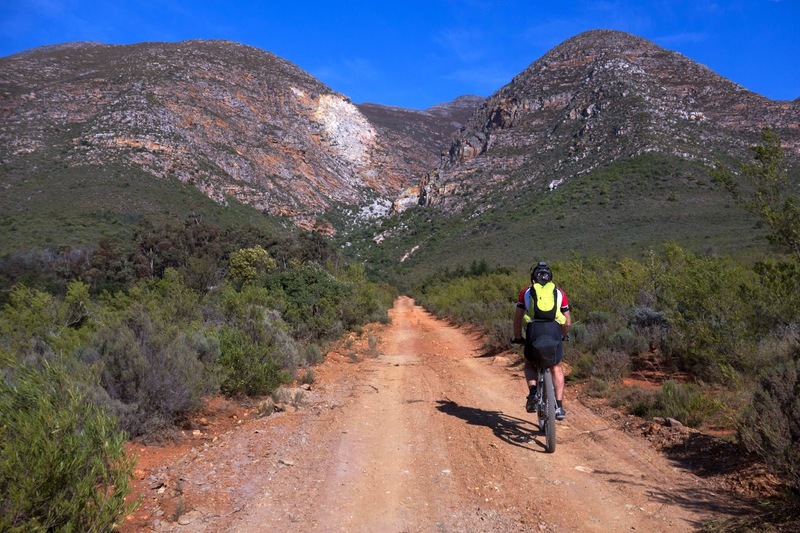 I careened down the steep slope until I came to a Y junction, which was marked by a rare "bokkie" — a Freedom Challenge trail marker, of which there were a few dozen on the entire 2,400-kilometer course, always at random intervals and never in the most confusing spots. But this one mattered. "It's here! It's here!" I called out. A minute went by, and still no Liehann. Finally, I started yelling louder. "Bokkie!" I screamed. "There's a bokkie down here!" Finally he rolled down the hill. I was offended. "You weren't going to come down," I teased him. "You didn't believe me." 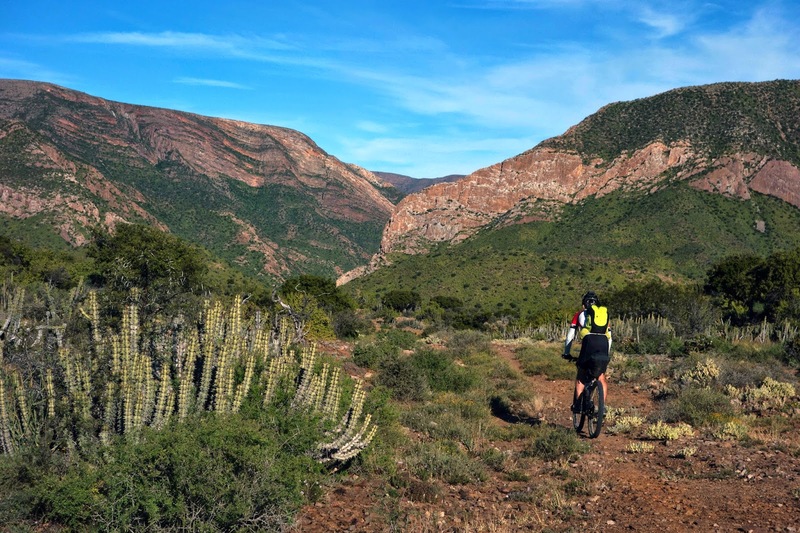 After a steep descent we climbed again to a game gate, and then launched into one of the most incredible segments of the entire trip — 15 kilometers of gradual but sublime descending on a rugged jeep track through the Voelrivier gorge. As the layered cliffs steepened, I stopped to take a photograph of interesting water markings on the wall. It was just then that I noticed what I thought had been part of the rock formation, starting to move. Giraffes! I crept forward as a herd of eight to ten gathered and crossed the track up a hill to our right. I watched them gallop up the slope, necks bobbing gracefully as their long legs swept over the grass in a beautiful angular motion. It occurred to me that my only reference for giraffes were the animals I'd seen in small enclosures at the zoo — standing still. I had never seen one run. It was enchanting. The herd gathered again higher up on the hill. 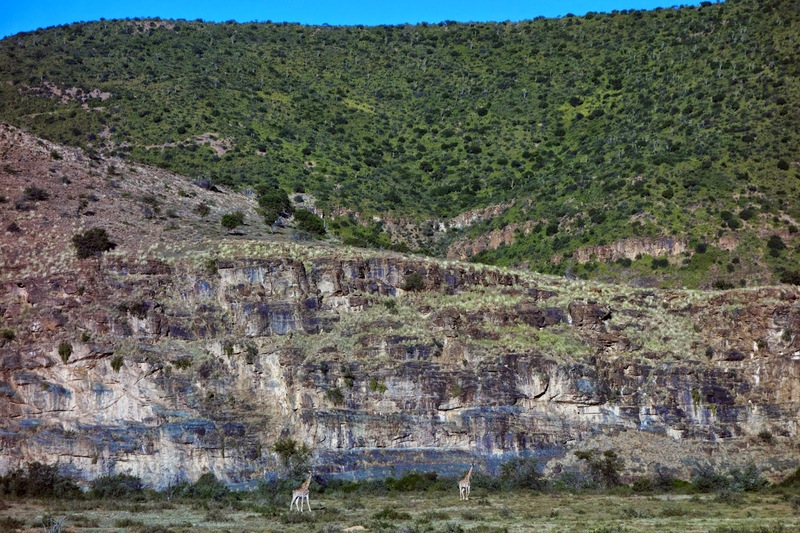 I could have watched them all day, galloping through the grass and grazing on trees in this deep and isolated gorge. But our modified race plan meant we had a long day ahead, so we continued pedaling along the dry riverbed. "If we left Gegun last night we would have ridden this section in the dark," I said to Liehann after apologizing for my alarmism. The portage hadn't been tricky, so I felt guilty about stopping short the night before — but at the same time, what was our purpose on the Freedom Trail? To finish, or to embrace every new day as a gift? As the days went on, I admit, I cared less about the finish — my reason for not wanting to quit was not wanting to miss a single kilometer of this incredible journey. "In the dark, we would have missed this." 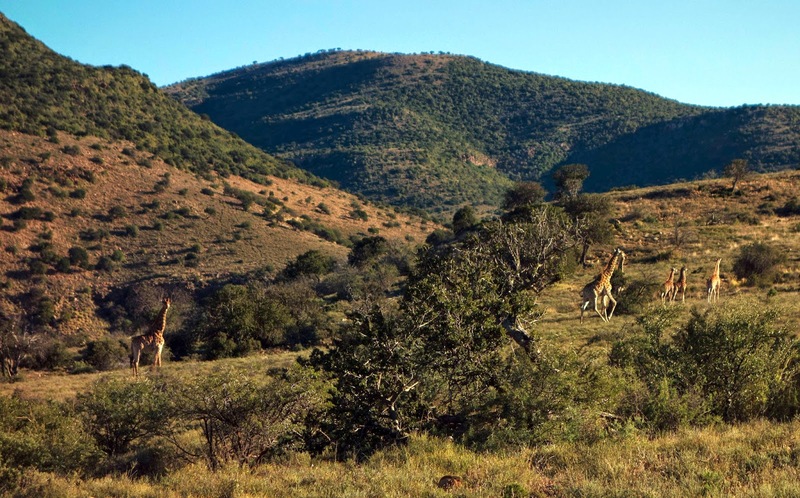 We were descending deeper into a low-elevation region of the Karoo where a high concentration of game animals reside. More game meant more posted signs warning about buffalo, hippo, and rhino, more sightings of kudu and wildebeest, and a lot more game fences. Sometimes we found creative ways to get around them — at this gate, we were able to squeeze ourselves and our bikes through a narrow opening above the lock. Others forced us to go over the top, and later that day, a tall gate with spikes prompted us to take the wheels off both bikes to more easily lift them over. These fences also sparked more stress than was warranted. But the problem was never knowing how many were ahead, or how long they would take to surmount. 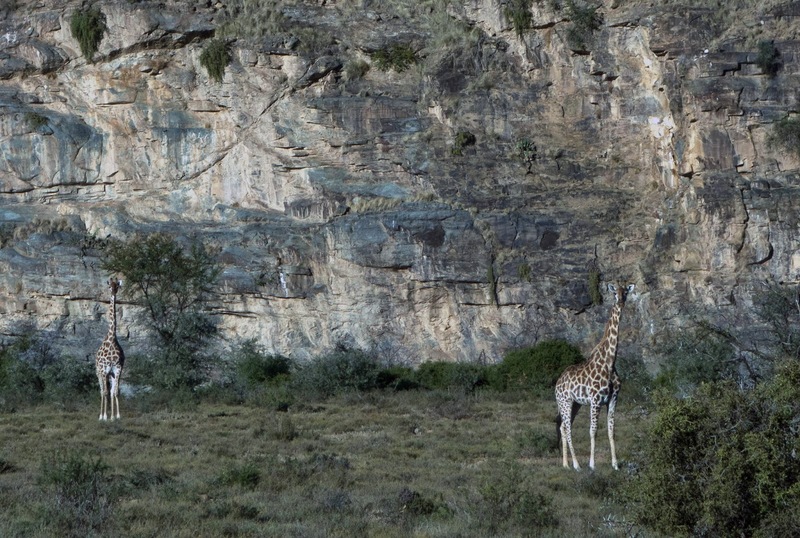 We navigated our way along the dry edge of a dam and crossed into Addo Elephant National Park. We saw no elephants in this corner of the park, but we did cross into another sort of Lost World. The jeep track along a dry river bed had been abandoned many years ago, and was almost completely reclaimed by these thorn bushes. Called the Karoo thorn or Aracia karoo, its conspicuous spines are sharp enough to impale skin, as happened to my poor calves on two occasions. They also find their way into bicycle tires, sticking out like toothpicks bubbling with sealant. You can't pull them out, as the holes they create are on the margins of being too large to re-seal — you simply have to keep riding and hope the excess thorn eventually breaks off, leaving behind a suitable plug. 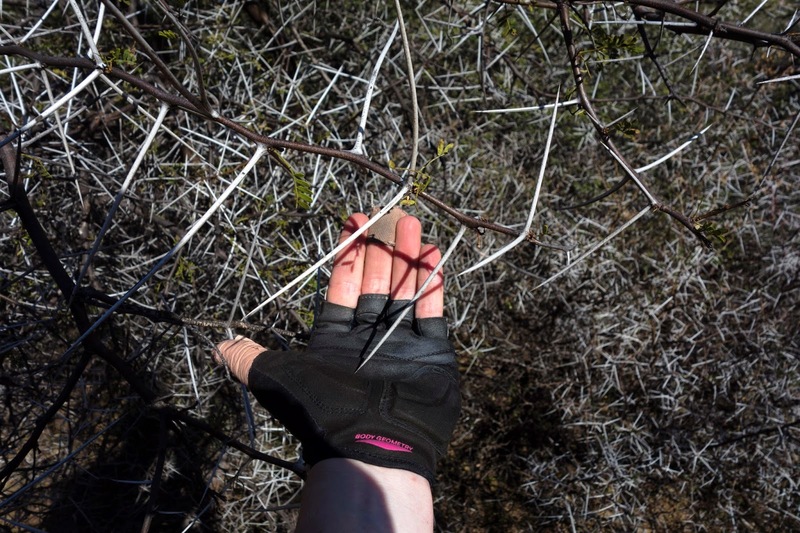 Despite extremely cautious riding and carrying our bikes through the worst patches, Liehann and I must have picked up a dozen or more of these thorns. I'm still afraid to open my bike's tires and see what lurks inside, but the tubeless system worked wonderfully. I never had a single flat; the most I had to do was top off air pressure. 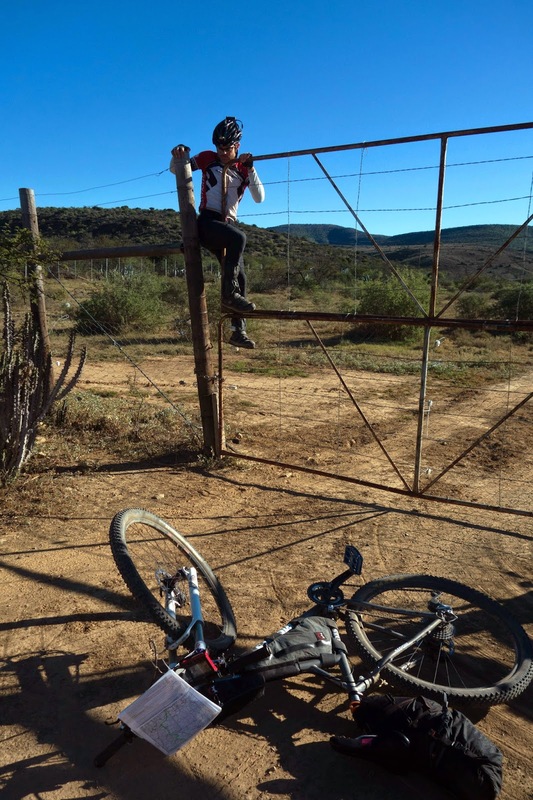 Our new schedule necessitated another 130-kilometer day with lots of tough riding, and we arrived late in Kleinpoort. We met a nice couple who worked as bird researchers and birding guides who were staying as guests at the house that hosted Freedom Challenge racers. They hadn't expected our arrival, so we felt guilty for bursting in on them after 9 p.m. We made our dinner from a box of emergency provisions provided by the race — ramen noodles and crackers. The man gave me some of his leftovers — plain boiled cauliflower, carrots, broccoli, and corn on the cob, apologizing that there wasn't more. I was so thrilled to eat a big batch of vegetables that I declared it my favorite dinner in days. The following day, I think Liehann still had ambitions to make up our lost half day. We made quick work of the thirty kilometers into Bucklands, and even after enjoying a leisurely breakfast of lamb shepherd's pie that was supposed to be our dinner the previous night (they actually had been expecting us), and despite a harsh headwind and plenty of climbing, we made also made quick work of the next 42 kilometers to the intermediate stop in Hadley. As we got closer to Hadley, I checked my watch. 1 p.m. I slowed my pedaling, trying to stall as I watched Liehann race ahead. Although we agreed to the plan to stop here, I thought he probably wouldn't be thrilled about stopping this early in the day when we were a half day behind schedule. He might think there was enough daylight to take on this next portage. I strongly disagreed. Although I'd been admittedly too timid about the section after Gegun, this one was truly alarming — twenty kilometers of steep ascents and descents followed by fifteen (or more, it was usually more) kilometers of river valley bushwhacking that sounded even trickier than the Vuvu Valley, and likely a lot slower. These directions told us to look for indentations in the reeds instead of a trail — indentations made by who? The two guys who were in front of us? There were supposedly 11 river crossings "that look wide but are usually never more than waist deep and there are no crocodiles." They way they made an effort to point out there were no crocodiles made me wonder if there actually were. Either way, I was in near panics about the prospect of taking on the Groot Rivier gorge in the afternoon. I came up with a plan to convince Liehann to stay in Hadley. 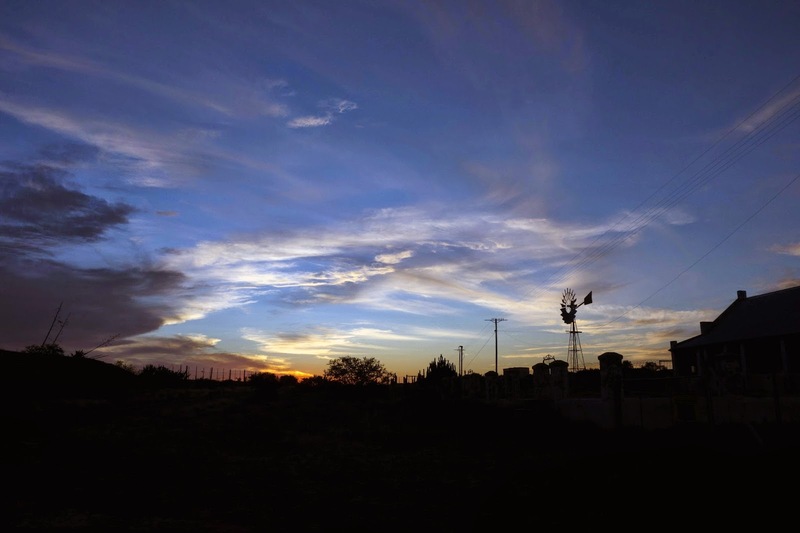 We'd get a super early start — 4 a.m. if necessary, to get through the first twenty kilometers before sunrise. 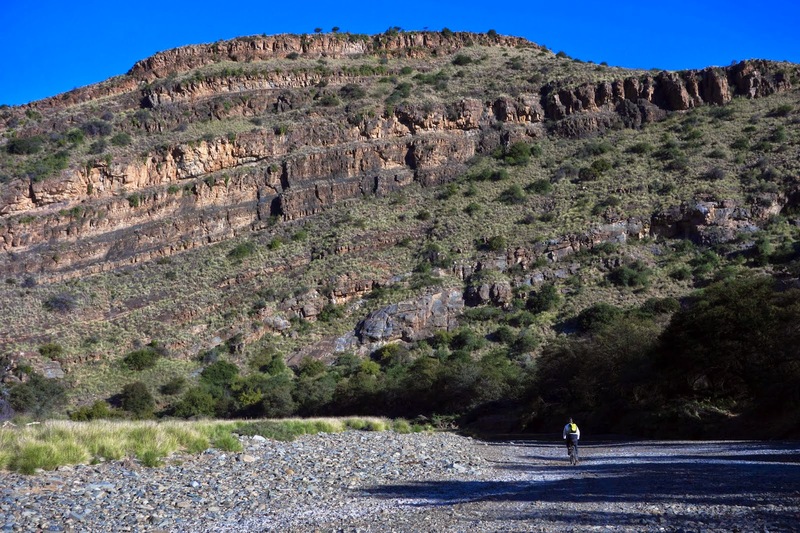 Then, if the river bushwhack went well, we could ride late into the day to click off 130 total kilometers into Damsedrif. And if it didn't go well, we'd at least have an entire day to hack away at the 50 kilometers into Cambria. The family at Hadley also hadn't expected us — despite filing our plan two days earlier, no one had been forewarned. But Anine and Bennie welcomed us with open arms anyway, and we enjoyed a long afternoon rest getting to know them better. I had tea with Anine, called Beat, took a hot shower, actually shaved my legs, and almost felt like a regular person again. I watched the sun set over the beautiful sandstone cliffs behind the house, and realized I needed to relish this sanctuary of warmth and kindness. Tomorrow, we would descend into Mordor. 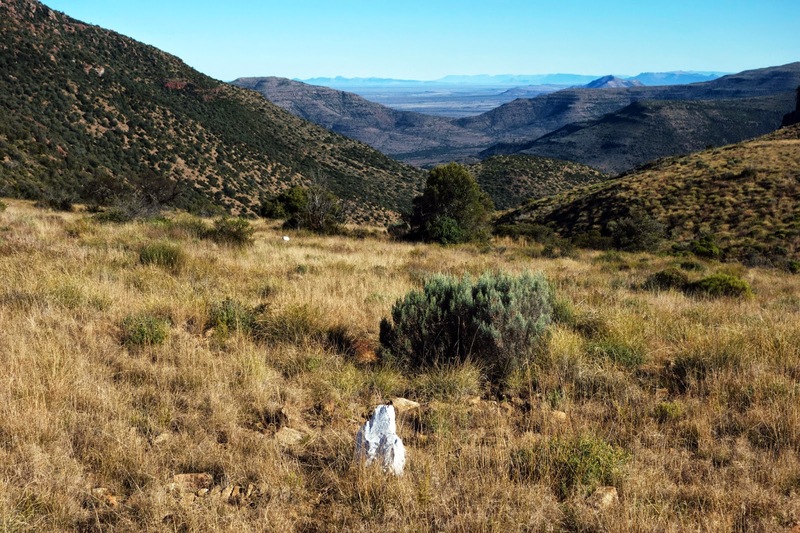 Dear Jill, Dave Hobson, the farmer at the bottom of the Struishoek portage and his workers marked the route by whitewashing some rocks. He decided to do so after too many cyclists got lost coming down. I thoroughly enjoy your writing and your insights. Like others it is the first thing I check when I switch on my computer in the morning. I especially look forward to your section on Baviaanskloof. That first giraffe picture filled me with an almost childlike joy and awe, even after (maybe?) seeing it on Facebook. Just the thought of seeing the giraffes in the wild..amazing. I haven't been commenting, but I've been looking forward to each installment as you add yet another adventure to my bucket list. Agree with Kate, the giraffes look so unbelievable. I love the race reports - like a travel book in instalments. 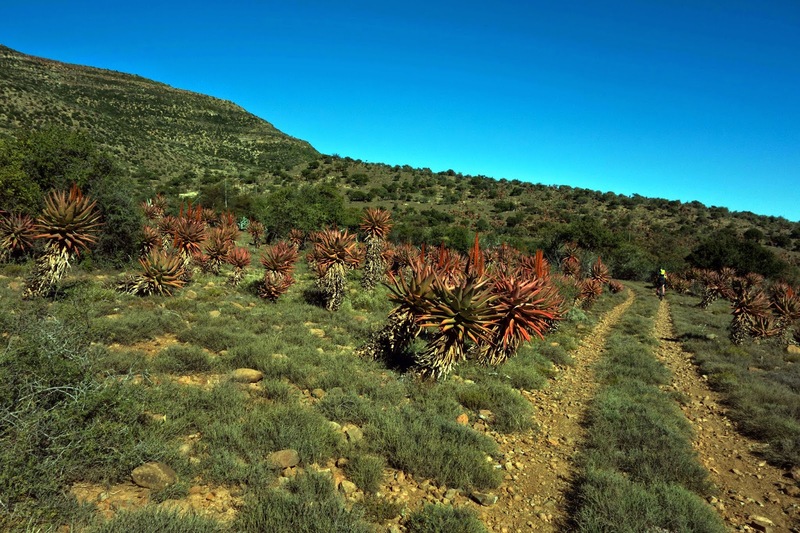 I would so love to be brave enough - SA is a beautiful place with fantastic plants.